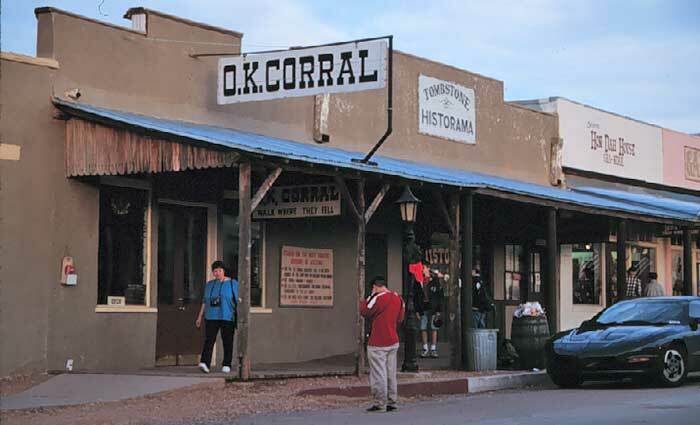 Tombstone, Arizona is often called the most famous of Arizona's old mining camps. Its rich and colorful history began when the southeast region of Arizona was acquired from Mexico by the Gadsden Purchase on December 30, 1853. Ed Schieffelin arrived at Camp Huachuca in 1877 and as he wandered off to prospect nearby, his comrades told him he would find his tombstone before finding silver. When Ed staked his first claim, he named it "Tombstone." He also made claim to the Toughnut, Lucky Cuss and Contention mines where he found silver and ore. In January 1879 the Tombstone Mill and Mining Company was established, and in April of 1879 the first house was built on the corner of Fourth Street and Allen Street by J. B. Allen; there he owned and managed a store. When rumors of the rich strikes made the mining camp a boom town, the settlement adopted Ed's name. In December 1879, Tombstone was incorporated as a village by the vote of the people; William A. Harwood became the first mayor. In March, 1880 the first railroad from Tombstone to Tucson was completed. Over the next seven years, the mines produced millions of dollars in silver and gold, before underground water forced suspension of mining activities. As thousands of treasure hunters sought to strike it rich, Tombstone gained a reputation as a town steeped in violence and lawlessness. This reputation culminated with the infamous Earp-Clanton Gunfight at the O.K. Corral on October 26, 1881. By 1881 Tombstone's population had grown to between 6,000 and 7,000 people. In January, the first telegraph was connected to all points of the Tombstone region and the same month, Cochise County, where Tombstone resides, was created, making Tombstone an officially incorporated city. Virgil Earp, the brother of former Marshal Wyatt Earp, became the Chief of Police on July 4, 1881 and on October 26, 1881 the Gunfight at the OK Corral took place, resulting in the deaths of Tom McLowery, Frank McLowery and Billy Clanton. By January 1902 the first electric lights and the telephone system for Tombstone were in place. In 1910 the price of silver had dropped to 50 cents per ounce, and by 1930 the County Seat was moved to bisbee. Tombstone's survival of the Great Depression and two devastating fires, along with the flooding of its mines, and its subsequent rebirth with the restoration of its many historic buildings and now, its daily tourism, earned Tombstone its nickname, "The Town Too Tough To Die." 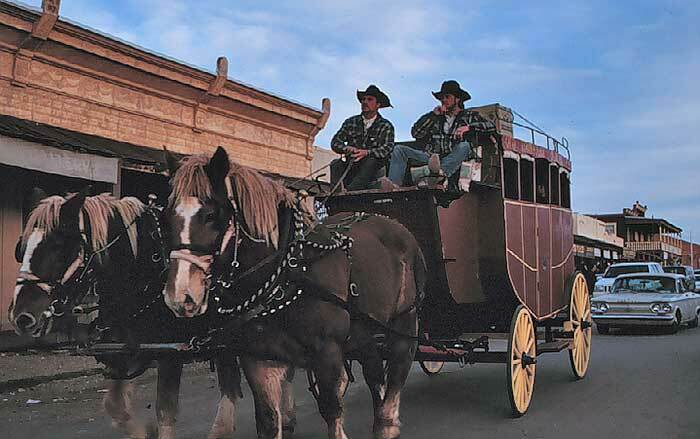 Tourists in Tombstone find themselves stepping back into the past as they witness re-enactments at the OK Corral or strolling along the boardwalks on Allen Street where the Bird Cage Theater, Big Nose Kate's or The Crystal Palace, some of Tombstone's best known saloons and tourist attractions, still stand. The Bird Cage Theater, a saloon and dance hall, opened in 1881, and during its brief nine-year life, was one of the most famous saloons in the country. It was named for the 14 "bird cage" crib compartments that run along each side of the ceiling. These "cribs," really nothing more than small rooms with red velvet curtains overlooking the floor below, were for "ladies of the evening" who used them to entertain their clients. The saloon was the site of 16 gunfights, and bullet holes riddle the walls and floors. The Bird Cage closed in 1889 when the mines that were the source of Tombstone's wealth flooded with underground streams, and Tombstone's population trickled away. The theater was boarded up completely intact and stayed closed for over 50 years, until it was reopened in 1934, with everything inside preserved in its original state. Even the coin-operated juke box still works. 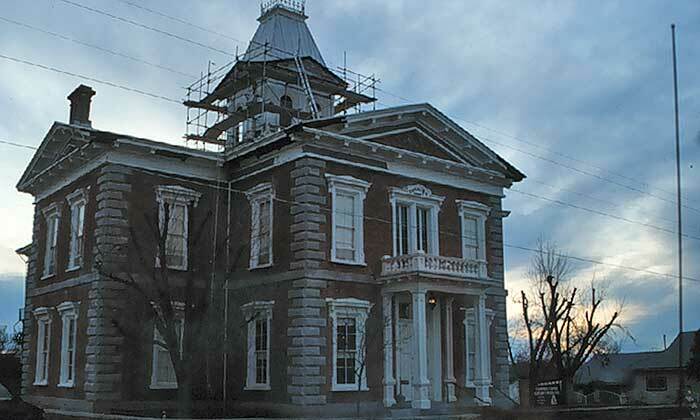 The courthouse was built in 1882 at a cost of nearly $50,000. But when the county seat moved from Tombstone to bisbee in 1929, the grand old building faced an uncertain future. The building stood vacant until 1955, when the Tombstone Restoration Commission acquired it. It opened as a state park in 1959. This splendid, living cave is located only 30 minutes north of Tombstone. Tombstone is located in Cochise County in southeast Arizona, 70 miles southeast of Tucson, 20 miles east of the San Pedro River and 15 miles southwest of the Dragoon Mountains. Tombstone is world renowned for its mining history and the "Gunfight at the OK Corral" in 1881, between the Earp brothers -- Wyatt, Morgan and Virgil -- and the Clantons, Frank and Tom McLowery. Situated at an elevation of 4,540 feet in the Sonoran Desert, Tombstone's year round climate is rather mild, from winter overnight lows in the 20s to summer daytime highs in the 90s. Tombstone receives about 13 inches of precipitation annually. 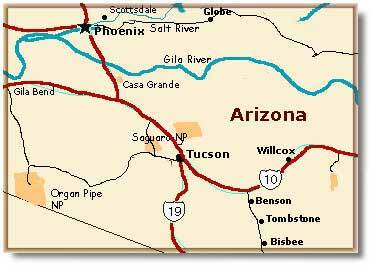 Tucson, Arizona: 73 miles northwest. Willcox, Arizona: 59 miles northeast. Sierra Vista, Arizona: 24 miles west. Benson, Arizona: 27 miles north. bisbee, Arizona: 24 miles south. Nogales, Arizona: 66 miles southwest. Douglas, Arizona: 49 miles southeast. Sonoita, Arizona: 35 miles west. Coronado National Memorial: 44 miles southwest. Fort Bowie National Historic Site: 95 miles east. Chiricahua National Monument: 103 miles east. Saguaro National Monument (East): 68 miles northwest. Kartchner Caverns State Park: 30 miles north. Cochise National Recreation Area: 60 miles east. Madera Recreation Area: 51 miles west. Coronado National Forest: 35 miles west. San Pedro Riparian National Conservation Area: 11 miles west.